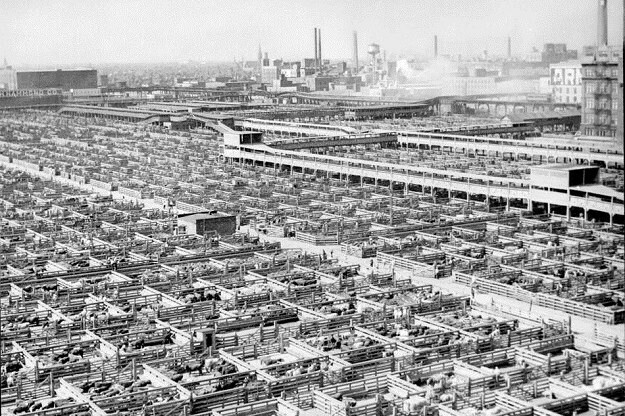 Carl Sandburg called Chicago the “Hog Butcher for the World.” He wrote those words in 1916, celebrating the city’s great stock yards. The yards were the place where live animals were slaughtered, so that they can be turned into packaged meat for consumption. During the 1850s Chicago was becoming a railroad center. That made our city the final destination for the cattle the cowboys were driving to Dodge City and Abilene and Wichita and all those wild towns you used to see in the Western movies. 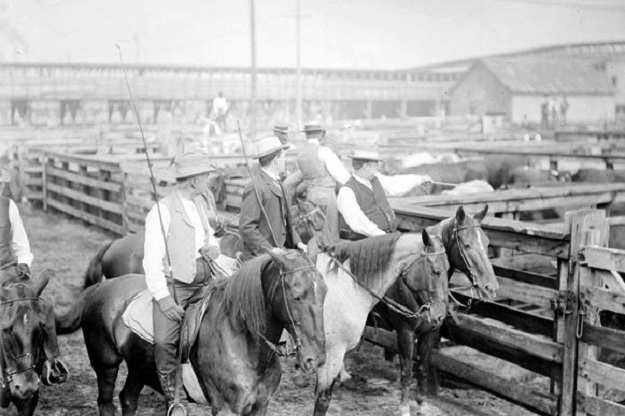 At first there were many little stock yards around Chicago near the different railroad lines. In 1861 the Civil War broke out. Meatpacking boomed. With the industry outgrowing those small scattered sites, a group of railroads got together to build a consolidated facility. They settled on a location near the edge of the city, at Halsted and 39th (Pershing). The Union Stock Yards began operations on December 25, 1865. The holiday date was not planned. Christmas Day happened to be when the first shipment of hogs arrived. After the yards were established, Swift and Armour and the other packers opened plants in the area. Meatpacking became the city’s biggest industry. At one time, it employed one out of every five working men in Chicago. Conditions on the job could be miserable. In 1906 Upton Sinclair published a novel about a working family in the district titled The Jungle. The book created a national sensation, and spurred reform legislation. The yards eventually took up almost an entire square mile, and there was even an ‘L’ branch that ran right onto the property. The neighborhood to the southwest became known as Back of the Yards. When sophisticated travelers visited Chicago, they usually included a stop at the Union Stock Yards on their itinerary. By the 1920s over 15 million animals were going through the yards each year. With that many animals in one place, the air would get pretty ripe. Sox Park was only a mile away from the yards, and during the summer, when the wind came out of the southwest, the odor was unbelievable. I always thought that smell was one reason the Cubs had more fans than the Sox. After World War II the meatpacking industry changed. Large central slaughtering facilities became obsolete. The Union Stock Yards closed in 1971. Today the site is an industrial park. Maybe it’s not a tourist attraction any more. But it sure smells a lot better.